I’m very glad that the science-fiction genre is back and doing very well these days. The more sci-fi in theaters, the better. And we have what seems a pretty good lineup this summer of movies that involve everything you could want in a science-fiction film. 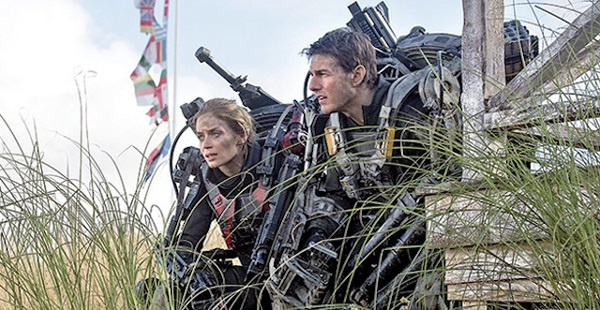 Here to start off June 2014 is ‘Edge of Tomorrow‘, formally titled ‘All You Need Is Kill‘, which is based on the 2004 novel by Hiroshi Sakurazaka of the same name. Director Doug Liman (‘Swingers‘, ‘Go‘, ‘The Bourne Identity‘) took a swing at this $178 million dollar budget film and hit a home-run. Although we may have seen similar things in different sci-fi films before, this film feels fresh and original with its great script, good performances, and amazing special effects. One could say that this is like the movie ‘Groundhog Day‘ but with an apocalyptic alien invasion backdrop thrown in that stars Tom Cruise. And let’s face it, if Tom Cruise is in the film, you can rest assure that he will save the day, the planet, the solar system, and the universe. The guy just gets things done. We follow a man named Cage (Cruise), who is a military officer journalist who is in charge of convincing the human race that we need to send as many people to war to take out this vicious alien race that has attached our planet and left major cities in utter ruin and millions dead. These aliens are called Mimics, and they look amazing and evil in all the right ways. Their bodies look metallic and have many tentacle like arms and spears. They can move at lightning speed and are super strong. These aliens look like a futuristic killer octopus hyped up on the best speed that money can buy. They can be killed, but it takes some fairly impressive firepower to do so. Needless to say, the Mimics are winning the battle. After a rough talk with the head general (Brendan Gleeson), Cage finds himself demoted to Private and is about to be shipped off to the literal front line of a full scale attack on the Mimics. Even with a full metal robotic endo-skeleton for armor, Cage only lasts a few seconds in battle when he is dropped off (Normandy Beach style), as he has never seen combat or used a weapon before. 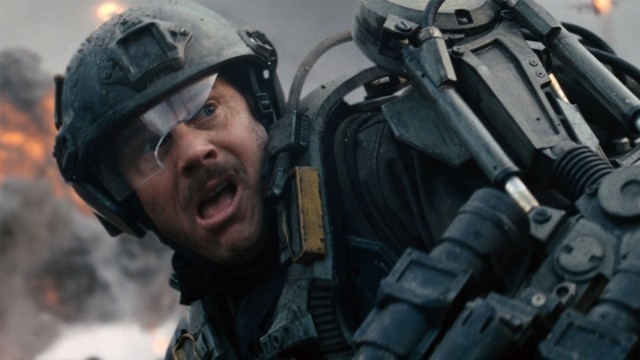 However, after he is killed by a different looking Mimic, he awakens the day before when he is demoted to Private and has the same conversations with his new officer Master Sergeant Farell (a hilarious Bill Paxton). Everything happens the same exact way, but when he dies, he loops back to waking up at the military base and demoted. A woman named Rita (Emily Blunt), realizes what Cage is going through and asks him to find her when he wakes up again. Rita is the literal poster child for bucking up, becoming a badass, and killing Mimics, as her face is on every bus and billboard around, telling people to sign up for the military. Once Cage and Rita meet up, they figure out that the only way to win this alien war is to kill the head Mimic called the Omega, which is very similar to Vampire lore. So the film plays out like ‘Groundhog Day‘ with Cage learning and going further into finding the Omega each day, but is always met with death on the beach, thus repeating each day. Watching a movie that loops over and over can get tedious, but Doug Liman and his editors did a flawless job in keeping things fresh and non-redundant. At no point in time did I say to myself, “Here we go again with this.” Instead, we got different perspectives and comical moments from Paxton and Cruise. It was nice to see Cruise “not know how to fight”, at least for a little while here and was met with some good laughs. There are some small nit-picky things I can go into and pick apart, but they are so minor, I’m not going to bother, although I did think the overall ending was wrapped up too nicely with a pretty bow, which is something that recent Tom Cruise movies have a lot of. The special effects are a mix of practical and CG and look very impressive. This proves that Liman can take on a blockbuster budget action film and succeed. I only hope that it makes its money back, because it deserves too. 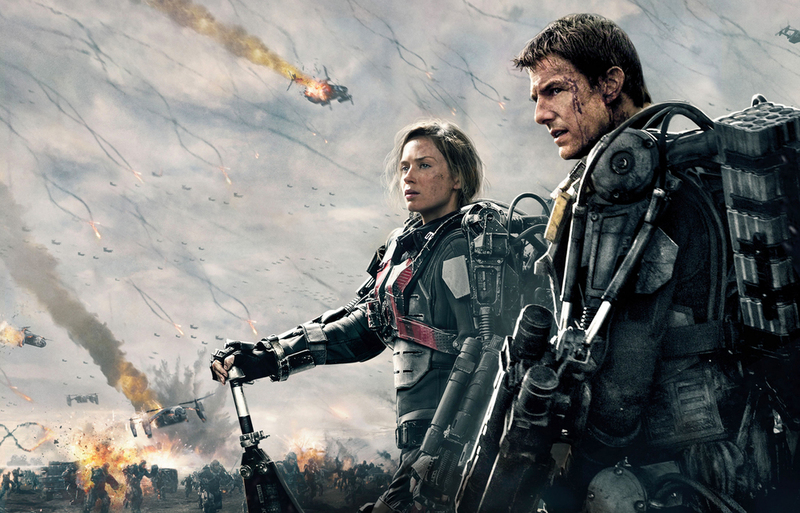 ‘Edge of Tomorrow‘ is highly entertaining and is an excellent addition to the sci-fi genre. I can’t wait to watch it again on repeat. This entry was posted on Thursday, June 5th, 2014 at 11:28 am	and is filed under Film, News. You can follow any responses to this entry through the RSS 2.0 feed. You can skip to the end and leave a response. Pinging is currently not allowed. « Film Review: ‘Words and Pictures’! !